Geez, is it hot! 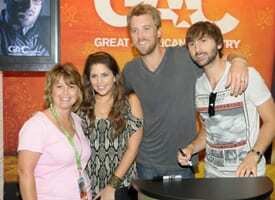 Day Two of the CMA Music Festival was a carbon copy of Day One, weather-wise. The streets of downtown Nashville sizzled in the mid-90s. But I’ll be darned if the fans weren’t having a ball in spite of it all. Music poured from every club, bar and honky-tonk on Lower Broadway. Vendors gave away Harlequin romance paperbacks, and free cups of Blue Bell ice cream were being eagerly consumed by everybody. 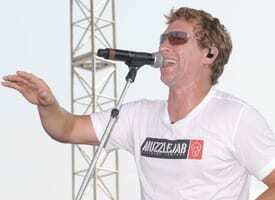 Fans tried their talents at karaoke, bull-roping and NASCAR contests. When I stopped by the Hard Rock stage (6/9), Kimberly Wolff was singing splendidly. She was followed by a romping set by Her & Kings County. Up on the Bridgestone Plaza (6/9), Daryle Singletary was moaning magnificently on “The Note,” “I’m Living Up to Her Low Expectations” and other hard-country numbers. 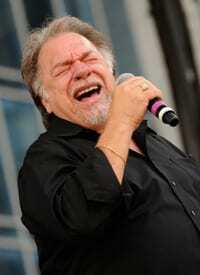 Keeping with this concept, the same stage hosted the great Gene Watson later that afternoon. 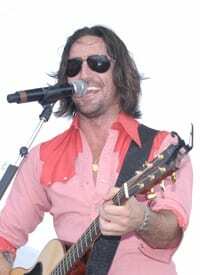 The Bud Light Stage in the Sports Zone booked Sean Patrick McGraw, Due West and more. The Chevrolet Stage, also in the Sports Zone, competed with Sonny Burgess, among others. I went down to the Riverfront Stage to mingle. Despite the heat, it was so packed with fans you could hardly move. I literally inched my way along in the body-to-body density. Down on stage, Craig Morgan was roaring, climbing stage girders and finishing with a fiery “International Harvester.” What a singer. Linda Davis was hosting with verve and charm. I don’t think I’ve seen anybody do that gig better: She talked to those fans like a friend, urging them to drink plenty of bottled water. She wasn’t kidding. By yesterday evening more than 225 people had been treated for overheating problems (By comparison, during the entire fest last year, 400 such cases were reported). Eight of them were taken to the hospital. Street vendors did their part by offering bottles of water for only a buck apiece. Hot dogs, too. “You’re changing our lives,” he told the crowd. After his show, he greeted fans at the backstage fence. They sang to him. “As soon as we hit the opening guitar notes to ‘Barefoot Blue Jean Night,’ they started to scream,” he marveled. “That was incredible. I’ve never had a song like that.” And it isn’t even in the top-10 yet. 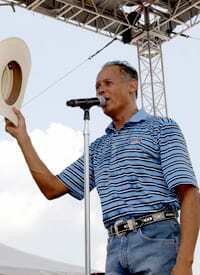 Following Jake was Neal McCoy, which made it three-for-three in the high-energy department at Riverfront. And the crowd remained packed in the broiling sun. Backstage, the General Jackson showboat docked serenely on the other side of the Cumberland. On board, Gary Allan was hosting his fan club party. Meanwhile, up in the Durango Acoustic Corner in the Convention Center (6/9), I had my ears pinned back by the incredible, swing-happy Quebe Sisters Band from Ft. Worth, TX. As if their triple fiddling wasn’t awesome enough, they trio harmonize like angels. WSM deejay Eddie Stubbs is such a fan that he was up there enjoying the show on his day off. WSM-AM is broadcasting the Acoustic Corner sets live, by the way. Anyhow, I was so thrilled by the group that I went down to the Exhibit Hall to buy its CDs. Eddie introduced me to Grace, Sophia & Hulda Quebe, plus guitarist/producer Joey McKenzie. They have appeared on all three seasons of Marty Stuart’s RFD-TV show and have reportedly drawn more mail than any other guest. 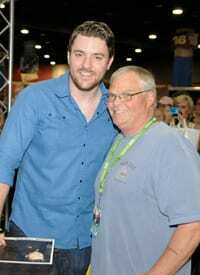 Elsewhere in the Exhibit Hall, Lady Antebellum, Chris Young, James Wesley, Phil Vassar, Rehab (a male duo), Riders in the Sky, Gloriana, Billy Ray Cyrus and The Adam Craig Band were signing autographs. Fans were posing for gag Dolly Parton imitator photos in Dolly’s booth. The Acoustic Corner delights continued upstairs with sets by troubadour Ernie Hendrickson, followed by Mark Wills. run-through/rehearsal for a couple hundred lucky festival attendees. The tour kicks off next week (6/16) in Biloxi, MS.
d, Jim Catino, Norbert Nix, Greg Fowler and Clint Higham. 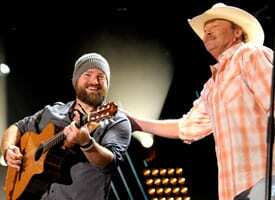 Unusually for CMA Fest, The Zac Brown Band was given a generous, hour-long set on the LP stage. The group used its time wisely, alternating its hits with guest appearances by Sonia Leigh, folk/pop/jazz standout Amos Lee and country superstars Randy Travis and Alan Jackson. The entire stadium sang along during the Randy & Zac duet of “Forever and Ever, Amen.” Alan walked out unannounced during “As She’s Walking Away,” creating fan pandemonium. Sara Evans, Jason Aldean, Kelly Clarkson and show-closing Brad Paisley and Alabama made for a star-studded concert roster. As several fans tweeted during the show, this year’s fest is arguably the most superstar-filled in the event’s history. Bill Anderson and Steve Wariner were warm and genial as co-hosts of the evening. The arena hospitality areas swarmed with Music Row fabulons. Working the room were Scott Borchetta, Scott McDaniel, Isabel Ross, David & Susana Ross, Ken Levitan, Beverly Keel & Ronnie Steine, Steve Buchanan, Mayor Karl Dean & Anne Davis, Lisa Harless (did you know her husband Winston is a former Opryland performer? ), Tony Conway, Allen Brown, Sarah Trahern, Tammy Genovese, Charles Dorris, Mark Roeder, Bo Thomas, Jim Havey, Ed Hardy, Neil Spielberg, Ron Cox and Bill Denny.